Yet again, Lagbaja is set to hit the airwaves with new works. This time he is dropping two singles. "Nothing For You", "Dream Come True" and "Never Far Away" are three Lagbaja love songs that became massive hits. "Did I" from his most recent album, took his love stories to another level with a Spanish-English duet. This time his love song brings a different dimension as he pleads, "Knock Knock Knock, open your heart, love wants to enter". Also a duet, Lagbaja is the repentant lover in this continuation of his love saga. when the chorus begins to plead "Don't shut your heart to love". songs from other continents is well on its way to becoming reality. them with this song. This he christens "2 African Soldiers". another Lagbaja classic. Attention! Salute two great African soldiers. Or should we say 3 great African soldiers? I've never post any comment on this blog, but, as long as it's Lagbaja, Linda, thumbs up. 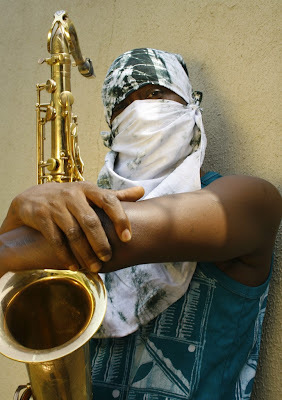 Lagbaja is a great guy whom I admire since listening to "Baby tani ko fe wa, sugonmu...."
Love Lagbaja. He's in a class of his own.